My Wandering Wednesday Series are dedicated to the flight of my imagination now and then, captured by my camera lens or nestled in my album. And then, songs and movies simply fill in the gaps for the right captions! I try to give you the back story of the picture too. Perhaps you may see a tale hidden there. Check the previous posts here. We lived in the same building. I must have been around 1 – 2 years of age. The three of them were older to me. Two boys and a girl. Before we knew it, we were living in each other’s houses. Aunty would make it a point to feed me before she left for work. Mom took care of the kids while she was away. Life was good, love was abundant. Once I fell real sick. The doctor advised my mom to give me Parle-G dipped in milk, as that was all I could swallow. The onus of feeding me was on the boys, as I was a real fussy kid. They would wait for me to not finish so that they could have the milk and biscuits. Another time, I was going through a rough patch in school with regards to Maths. The younger of the two was right by my side to help me through. He was the one who taught me how to use a dictionary. He also was the one who accidentally introduced me to the cutest boy in college, when he came to meet me. He even went on to work for the brand Parle-G later on in life. Time flew and they moved base. I found two more sisters and a brother. Rakhi was always meant for all three of them. The eldest of them was calm, composed and very patient. All of them took to us as their own. Over the years they relocated to US and Canada respectively. But even today, they are just a heartbeat away. And BTW, the youngest one’s daughter digs Parle G just the way I like it! And as the world celebrates bonds between siblings, I want to tell you all, nothing and no one can ever mean to me/us as much as you guys do. True, families can’t be chosen. Sometimes, if you are real lucky, they come gift-wrapped, next door. Disclaimer: All pictures belong to the author and may not be used in any form. Such wonderful memories and touching too. Yup Janu………….they are some of the best days of my life. Which is the ickle Vinita in those pictures? I want such wonderful gift wrapped friends and brothers too. You are blessed to have them in your life. Alka, you can say that again………….and yes, touchwood! 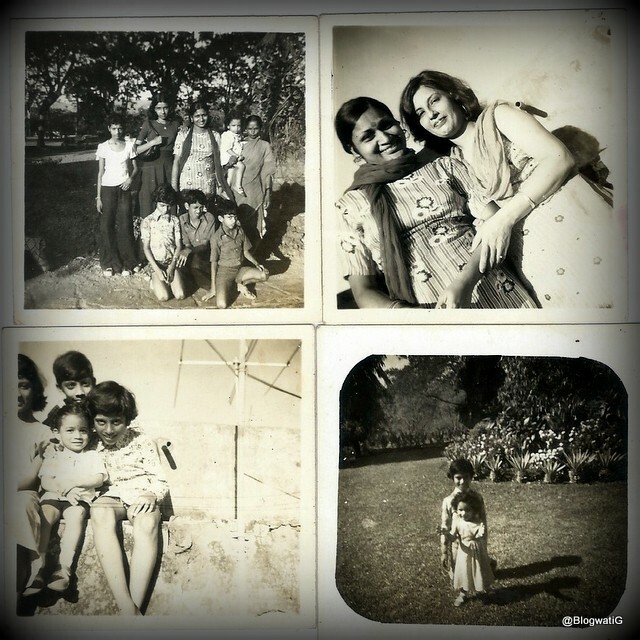 childhood memories are so precious ! Yup, you’ve got to be real lucky for a hand delivery like that 🙂 thanks for dropping by Priya. Lovely memories. I was lucky to find a dear friend who is more like a sister now next door. Kathy recently posted…Wordless Wednesday- Adventure! Ah such a warm and fuzzy post! I also had the same kind of friends and family in my childhood. But it is tough to find that kind of openness and warmth nowadays. So much of mistrust and “put on” behavior nowadays. This is so beautiful! Indeed, sometimes families come gift wrapped. Ditto for some of the friends we find on our journey of life! What a sweet bond you guys share! And, here’s raising a toast to Parle-G and the girl (you!) who still clings on firmly to childhood passions!